The 2018 International Tetrathlon Exchange will be hosted by USPC, July 13-30 in North Carolina. Teams from the United Kingdom, Ireland, and Australia will join the United States teams for two weeks of training, competing, and cultural experiences. The International Tetrathlon Championships will be held in conjunction with the 2018 USPC East Coast Tetrathlon Championships. If you are interested in supporting the 2018 International Tetrathlon Team, visit: HERE and select “International Exchange – Tetrathlon: Strassburger Fund” under the ‘Designation’ Tab. Its time to meet the US teams! Meet Emma Reed. Emma is a C-2 Traditional member of Great Plains Pony Club in the Rocky Mountain Region. She has been a member of Pony Club for eight years and she began competing in Tetrathlon when she joined. Her favorite phase of Tetrathlon is Riding. 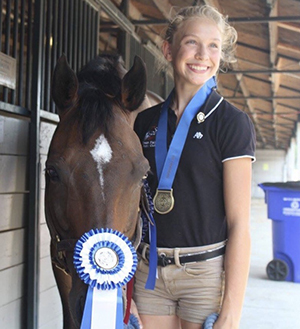 Emma’s best Pony Club memories come from riding with her teammates and helping the younger ones become better riders. She is looking forward to meeting new people and competing while still having fun during the 2018 International Tetrathlon Exchange. Meet your 2018 National Youth Board members- Micaela! Meet your 2018 National Youth Board members- Adeline!